Baška Voda is a small dalmatian town. It is approximately 45 km to the south-east of Split. Baška Voda, Baško Polje, and the surrounding villages of Topići, Bast, Krvavica, Bratuš and Promajna form a kaleidoscope of hospitality, tradition, modern life and a preserved environment. Crystal clear and warm sea, well preserved natural environment and magnificent geographical position in the heart of Dalmatia on the Adriatic coast make Baška Voda an ideal tourist destination. Baška Voda also forms part of the Makarska Riviera, which is a 60km stretch of coastline with some of the best (pebble) beaches in the whole country. Combine this with the exceptional variety of water sports available in the area and you’ll get an even better understanding of why it is such a popular holiday destination. 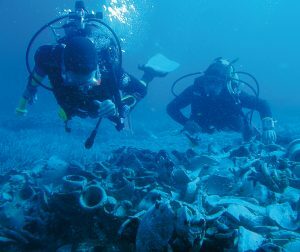 The region has some of the cleanest waters of the Adriatic sea. As a result the coastline has over 100 blue flag beaches, the EU-recognized stamp of approval, of which Baška Voda Beach is one. To be able to look out to sea from the beach at some of the country’s many islands, then to turn round and witness the awe-inspiring backdrop of the mountain. The stunning backdrop is the dramatic Biokovo mountain range, the second-largest in the country, and Sveti Jure, the highest mountain in the range at 1,762m. 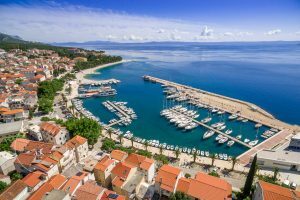 Staying at the Hotel Croatia allows you to soak up the atmosphere of this vibrant town, while also being made to feel very much a part of it. It is located just a few steps from the marina and all the towns bars and restaurants. After a comfortable night’s sleep and a delicious breakfast, what better way to begin the day than a stroll down to the beach, which is only 100 meters away. There is more to Baška Voda than sun, transparent sea and beautiful beaches amidst pine woods and fresh mountain air. 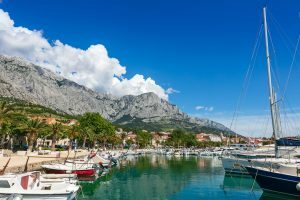 As for the choice of water sports available in and around Baška Voda, if you like to keep your feet dry, then there are plenty of boats for hire on a daily or weekly basis. However, if you like to get directly involved with the water, you’ll be spoiled for choice. You can chose from jet skis, windsurfing, scuba diving, snorkeling, parasailing, fishing and scaring yourself stupid on a banana boat, it’s all there waiting for you. For active holidays you can try rock climbing on the surrounding hills and Biokovo mountain, hiking, walking and cycling on Biokovo, boating and rafting on the River Cetina, zip line in Tučepi, ATV safari (quad), 5 island boat excursion. If you prefer less active holiday but still exciting, ideal are half day and whole day trips to Krka waterfalls and town Šibenik, Mostar, Dubrovnik, Split and Trogir, island Brač and Hvar, wine tour and visit to Imotski Lakes. So, if you’re wondering where to book your next holiday, we don’t think you need to look any further than Baška Voda, Croatia. To discover more or if you’d like to know more about Baška Voda and the Hotel Croatia, please feel free to contact us at any time.